Wondering why there are little blue leaflets like this on ‘reserved’ desks in the Library? Our #FairSpaceForAll campaign aims to encourage you to take action and use space that has been ‘reserved’ unfairly. 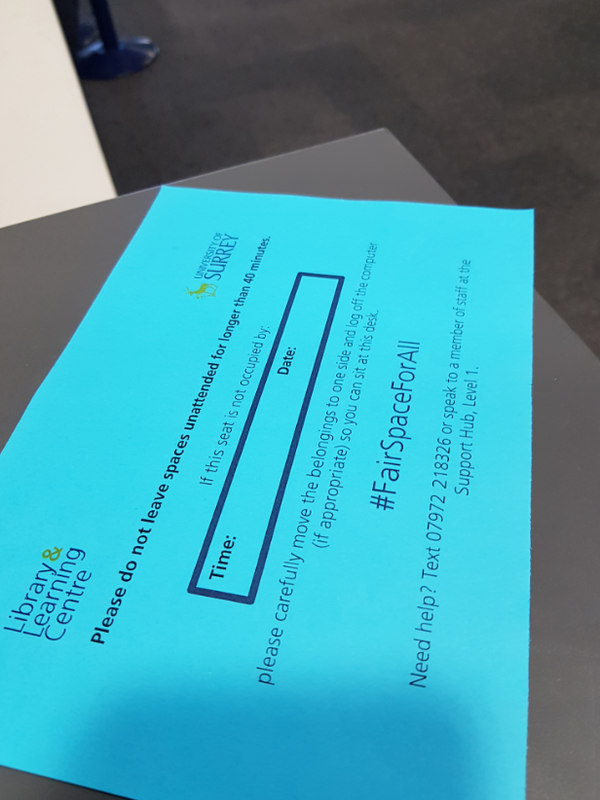 Look out for #FairSpaceForAll notices flagging up how long a space has been left empty, and if it’s been left for more than 40 mins feel free to move items aside and use the space. Or, if you see desks left abandoned for longer than 40 mins that we haven’t flagged up, just let us know by texting the noise alert number (07972 218326) or speak to a member of staff.